A demand feeder is normally a mechanical construction. A stick is attached to a slightly bowed plate sitting under a feed hopper. A demand feeder is normally a mechanical construction. A stick is attached to a slightly bowed plate sitting under a feed hopper (Fig. 16.3). The stick goes from the feeder down into the water. When the fish touch the stick, feed will be dispensed from the hopper. At the end of the stick is a knob, or something similar, which the fish touch. A great advantage with using demand feeders is that there is no need for an electricity supply. Furthermore, the design is simple with few moveable parts. The fish operate the demand feeder themselves, and can therefore theoretically be fed according to appetite (ad libitum). However, some feed loss has been registered. The fish may use the demand stick as a toy and feed may be lost; demand feeders are also sensitive to movements in the water, such as waves; wind may also affect the demand feeder so shielding may be included. Demand feeders are used for almost all species, even if some species, such as Atlantic salmon, are slow to learn the system. The fish need a training period to learn how to operate the system. Com-pared to hand feeding, both improved and less good growth results have been shown. In electronic demand feeders feeding is triggered by electric signals. The mechanical stick is replaced by an electric cable with a pressure sensor at the end. When the fish touch this sensor a signal is given to the feeder which starts. This system allows extra control over the demand feeding, for instance by setting fixed interval for the operation of the feeder or by setting a maximum limit of distributed feed per portion or per day. A more advanced control system is, however, required in this type of feeder. 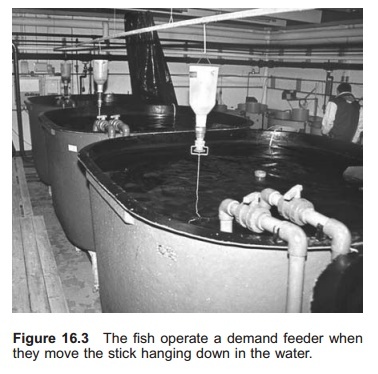 Much literature is available on the use of demand feeders, including the possibility for controlling the appetite of the fish experimentally.